This paper presents a subjective approach to routing in peer-to-peer and ad hoc networks. The main difference between our approach and traditional routing models is the use of a trust model to mediate the risk inherent in routing decisions. 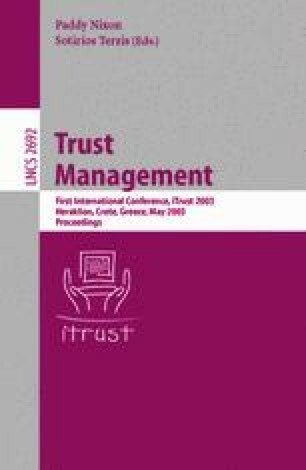 Rather than blindly exchanging routing table entries, nodes ‘discount’ recommendations from other nodes using a distributed trust computation which allows them to avoid malicious, faulty and unreliable nodes and links in routing decisions. Adding the risk model allows energy-efficient routing decisions to be made in a wireless network, and we show how our model can be optimized for different network behaviours, including wireless networks. The model is described in the context of the DSR  routing algorithm, although it is equally-applicable to others, including peer-to-peer routing substrates.